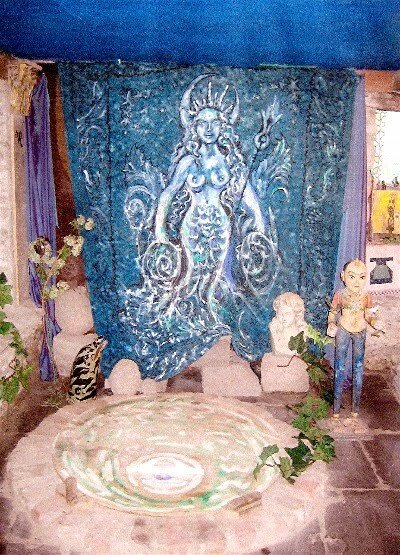 Painting in 1952 of the Goddess Dana of the Tuatha De Danaan as seen in a vision by Olivia Robertson. On left, ‘Mari of the Mists’ of the Atlantic Ocean, daughter of Manannán Mac Lir, Ocean God. Statuette of Dana, Mother of All the Gods and Goddesses of Ireland and Her Beloved Daughter Bride of the Well. Aengus Og, God of Love & Joy with his Birds. Altar Frontal: New Moon over Mt. Leinster. Our thanks to the Most Rev. Minette Quick for forwarding this. Click on the photo to see it a little larger, and then go to the archival link below to see it full-sized. "There is now a new wall hanging across the whole back wall behind the Well of Brigid at Clonegal Castle. The beautiful drawing - life size – is by an FOI Priestess and Artist. It is highlighted by Olivia Robertson who identifies it with Brigid Na Mara of the Sea and also with Goda, female equivalent of the Saxon “God”. Goda holds the trident like Britannia Atagartis, Syrian Sea Goddess." 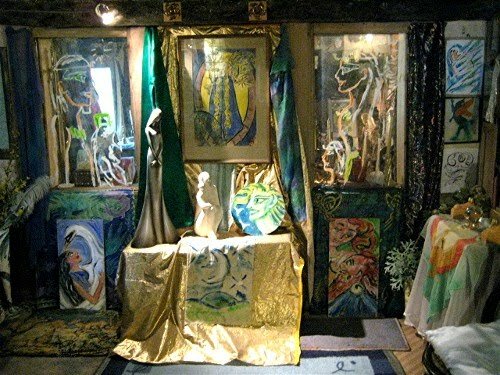 "For over fifty years Lawrence and Olivia Durdin-Robertson have given grateful thanks to so many donors of lovely pictures and craft works for their Temple of Isis. Now the time has come for those who have given, to receive acknowledgment of their work on our expanding FOI Global Centres. Many do not wish for this publicity, but other would appreciate being listed. This would be helpful for members wishing to order paintings, wands, figures and other works of art. Those wishing to contribute may give necessary information to the Hon. Secretary of the Archives Centre, in Tucson (www.fellowshipofisis.com), the Circle of Isis, California (isiscircleonline@yahoo.com), and the archives of our Isis Lyceum in Chicago, (deeankh@sbcglobal.net)." Additional information: Muses Symposium inquiries may also be addressed to the Star of Elen, U.K. (contactSOE@starofelen.org), the Circle of Pelagia, California (isishazel@yahoo.com) and Fellowship of Isis Germany (sekhmet@online.de).